"The public is never wrong." "A free press serves the governed not the governors." Thank you for visiting Mr. Robbins Digital Media & Communications website. 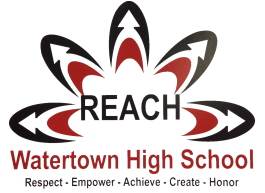 This page will serve as the online home for all of my courses at Watertown High School, with the resources and information necessary for you to grow as communicators and succeed in creating broadcast-quality projects that will be aired via our partners at WCA-TV. "Yakety Yak Let's Talk Smack"
"Raider News" continues as our flagship news magazine show styled after "60-Minutes" or HBO's "RealSports." Our student reporters will conduct interviews and create packages that highlight all the fantastic goings-on here at WHS. "The WHS Documentary Block" showcases the mini or micro documentaries made by the students of the Watertown High Documentary Film Production classes. "Dear WHS," is a student to student advice show inspired and styled by the columns of "Dear Abby" and Ann Landers. Student panelists answer your letters, emails, Tweets, and more on WHS on WCATV. "Secret Terminology Trap" Watertown High's own student written and produced quiz show pitting two teams against one another in a battle for vocabulary supremacy. Each of the three rounds are styled after classic television game shows including: "Chain Reaction," "Password," "Password Plus," "Super Password," "$25,000 Pyramid," and more. Interested in being "The Voice" of WHS??? Do you find yourself watching ESPN, NBC, or CBS thinking..."I want to be Mike Tirico, Bob Costas, Jim Nantz???" Mr. Robbins has been there and he wants to give you the opportunity to live your dream now. Mr. Robbins is IMMEDIATELY looking for students interested in being trained to cover WHS athletic events. Training is available for all positions including on-air roles. The training and event coverage would be extracurricular in nature and would qualify for WHS Community Service hours. Games would be aired on WCA-TV for the entire community to enjoy and to help build a following for WHS Athletics. Broadcasts would initially be one-camera in nature, with the potential to grow based on student commitment and interest. These opportunities are available school-wide and are open to ALL GRADES (9-12), regardless of whether you are currently a student enrolled in a Digital Media & Communications class during the current school year. Interested students should contact Mr. Robbins ASAP!!! Athletes competing in the active season would likely not be available to cover games, however training and opportunities can be made available during their non-sport season. If you have a passion for Raider athletics...be the face and voice that brings them to your community!!! All of Mr. Robbins classes will be utilizing Google Classroom technology to receive instructions, submit written assignments, and for grades and feedback of submitted work. Google Classroom also will create links to online quizzes that will be given throughout each course. What I did on my Summer Vacation 2018!!! Mr. R AWARDED 2014 MBA SPORTS PLAY-BY-PLAY OF THE YEAR!!! 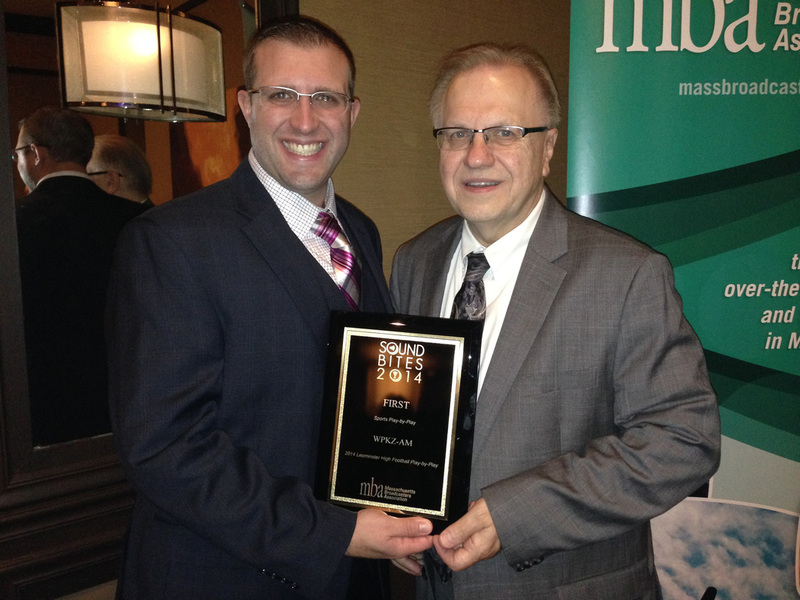 (10/29/2014) Todd with WPKZ Owner/General Manager Bill Macek holding the 2014 MBA Award for Sports Play-by-Play of the Year at "The Verve" inside the Crown Plaza Hotel Natick, MA. "[Television] a new art so important in its implications that it is bound to affect all society...an art which shines like a torch of hope...a creative force which we must learn to utilize for the benefit of all mankind."